Opio-Assist has three main features: Inform - This serves as a database of all the information that a recovering addict would need to continue on the path to recovery Community - this is a public forum and chat room that enables users to chat with each other and supports private messaging for all involved Alerts - this screen lets users make location based alerts to warn them when they approach an area that could be triggering. 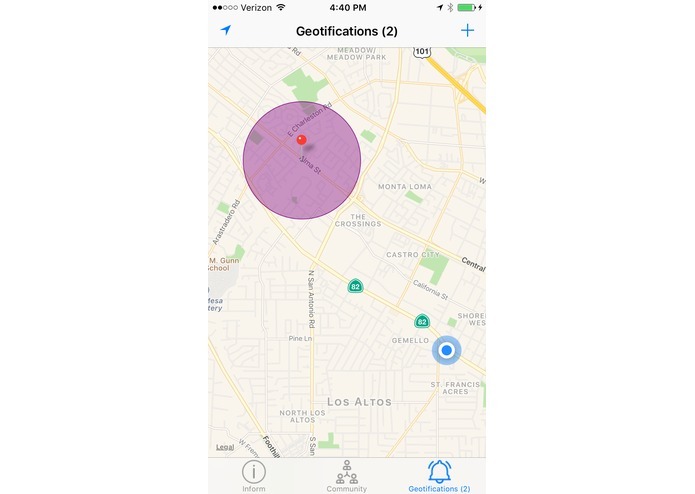 Some challenges I faced included finding an effective way to integrate alerts in the app. At first I planned to have location and also time based alarms, but then I remembered that alarms are a feature that every phone has anyways so I axed that and stuck with location. This took several implementations but I finally found an effective way to display alerts and let users add new ones. I'm proud that I built the whole thing in only 12 days by myself. With more time I would have been able to make something far more feature rich but given the time span I think that this is a very feature rich app with the important pieces that a recovering addict would need to carry forward. I learned how to make map based features in Swift that work effectively and provide new features including the rings and annotations. Opio-Assist will be live on the App Store soon and will be followed up with updates, links to get new users onboard and promotions for encouraging adoption and more use for those who really need it. 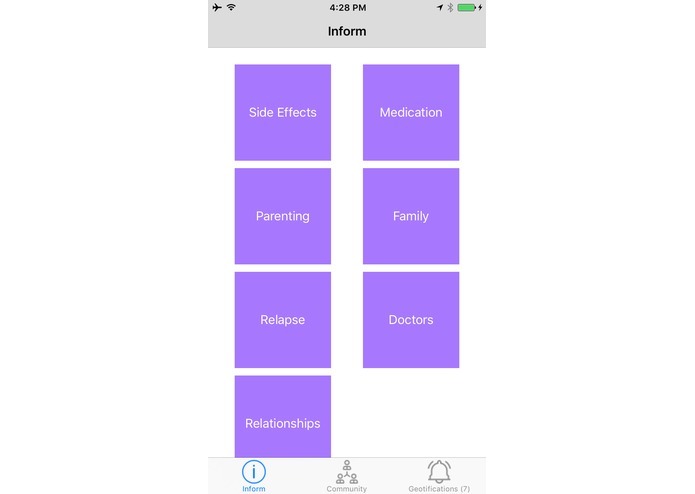 Insight 1: Insight 1 is covered by the “Side Effects” and “Medication” sections of the inform tab. Both include links to the various sites with specific information. Insight 4: “Relapse”, “Doctors” and the geo-notifications feature that users can take advantage of to have their phones alert them if they go too close to an area that may be triggering for opiod use. 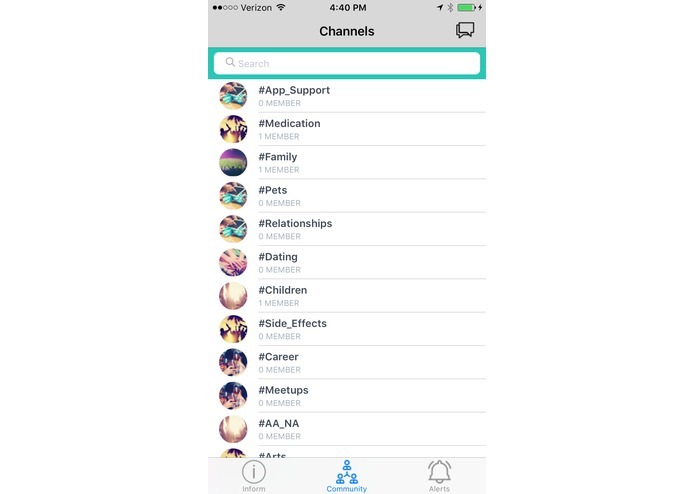 In addition to informational links several of these sections include links to find local meetings of AA, NA and other support groups On top of that, Opio-Assist includes a live forum/chat room that includes topics for all of these concerns so that in addition to users being able to find information on each of these topics they can also chat with each other to share tips, provide support and encouragement and know they are not alone. Making friends in their own position is vital to finding recovery and avoiding relapse. Insight 5: Users are encouraged to make use of the calendar and alarm features of their phones to handle their schedules. Replicating these features seems unnecessary. I imagined and built the entire thing, available for public download now! Updated to include a description of how the five insights are addressed. The original project listing had the incorrect UUID numbers. The app is now live on the App Store so please download the official version there to try it out. Thanks!